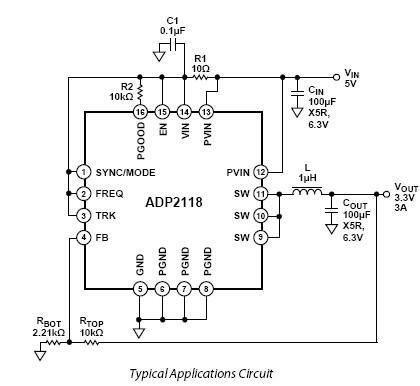 This 3.3V from 5V power supply circuit is designed using ADP2118 dc converter designed by Analog Devices ad is an synchronous, step-down, dc-to-dc converter. this 3.3V from 5V power supply circuit will provide output voltage of 3.3 volt at a maximum current of 3A. ADP2118 dc converter uses a current mode, constant frequency pulse-width modulation (PWM) control scheme for excellent stability and transient response. The ADP2118 can be configured to operate in pulse frequency modulation (PFM) mode that reduces switching frequency to save power. This circuit operate from input voltages of 2.3 V to 5.5 V. The output voltage of the ADP2118ACPZ-R7 is adjustable from 0.6 V to input voltage (VIN), and the ADP2118ACPZ-x.x-R7 are available in preset output voltage options of 3.3 V, 2.5 V, 1.8 V, 1.5 V, 1.2 V, and 1.0 V.
Some features features of the ADP2118 step-down dc-to-dc converter are: 3A continuous output current, 75 mΩ and 40 mΩ integrated FET, ±1.5% output accuracy,600 kHz or 1.2 MHz fixed switching frequency , synchronizable between 600 kHz and 1.4 MHz, Selectable PWM or PFM mode operation, Voltage tracking input, Integrated soft start, thermal shutdown .